Real Madrid manager Jose Mourinho is set to offload French midfielder Lassana Diarra and wants Michael Essien, 28, who he signed for Chelsea for £24million, as a replacement. 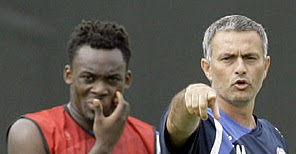 Essien had a poor season last year as he struggled to rediscover his form following knee surgery in 2010. The Ghana star's absence coincided with Chelsea's mid-season slump last term, in which the Blues went on the club's worst run in the league for almost 15 years and saw them crash from top to fifth in the table. Chelsea would want about £18million for the Ghanaian, as they pursue midfield targets of the own including Wesley Sneijder of Inter, Neymar of Santos and Tottenham’s Luca Modric.